Three years ago Peter Liang, a twenty-eight year-old Chinese American police officer in New York City, shot and killed Akai Gurley, a twenty-eight year old black man who immigrated to the United States as a child. Liang, according to his testimony, fired his gun while on patrol in a dark hallway in the Louis H. Pink Houses housing development after hearing an unexpected noise. That bullet ricocheted off a wall and pierced Gurley’s heart who was walking down the stairs with his girlfriend. Upon discovering Gurley, Liang and his partner failed to administer CPR or call quickly for medical assistance. Gurley died. He was not involved in any criminal activity, carrying a weapon, or committing any other offense. He was merely walking in a public place when he happened upon some police on patrol. A few months later, on February 20, 2015, thousands of protesters, the vast majority of whom were Chinese Americans, rallied in New York City to protest the conviction of Peter Liang for manslaughter. They claimed that Liang was being made a scapegoat in a time of heightened awareness about the killing of unarmed black men by police officers because he was Chinese American. White officers, they claimed, were never convicted of any wrongdoing even though they often acted more intentionally than Liang. Liang got scared and fired a shot in the dark that happened to ricochet and hit Gurley. There is video evidence of white police officer’s intentionally shooting unarmed black people in the back who have been found innocent of all wrongdoing. Liang’s conviction, they claimed, was evidence that the old American colloquialism born of anti-Chinese prejudice, “Not even a Chinaman’s chance,” is still too true. Indeed, Liang was the first New York City police officer convicted for a line-of-duty shooting in over a decade. These protesters were met by a multiracial collection of protesters, many of them affiliated with the Black Lives Matter movement, who cheered his conviction and were there to protest the message of the primarily Chinese American protesters angry about Liang’s conviction. This second group of protesters were glad that a police officer was finally being held accountable for killing an unarmed black man. Amongst the counter-protesters were some Asian American activists who insisted that Gurley’s killing was a greater injustice than Liang being the first officer to be convicted of a crime in the shooting of an unarmed black man. Yes, many claimed, it is suspicious that the first police officer to face real consequences for such an act is a Chinese American. However, Liang did kill an innocent man and police officers, regardless of their own race or ethnicity, need to be held accountable for their racially disproportionate abuse of power. In distinction to the Chinese American protesters opposing Liang’s conviction, a group of young Asian Americans from across the United States and across ethnic groups crowdsourced a “Letter for Black Lives” after the police-shooting of a black man named Philando Castile during a routine traffic stop in Minnesota, which was filmed by his girlfriend. The letter has been translated into numerous Asian languages and is an attempt by young Asian Americans to explain to their parents and grandparents why they support the #BlackLivesMatter movement when so many of their older relatives do not. It cites the reality of interracial friendships, statistics about the ways blacks are disproportionately killed by police officers, and the long history of racial discrimination against black people in the United States. In compelling fashion, the letter states that such racism is “an assault on all of us, and on all of our hopes for equality and fairness under the law.” The writers raise the reality that many Asian Americans are able to see the ways that they share in the experience of being discriminated against with many other racial and ethnic minorities while also being able to see the unique ways they benefit from “model minority” status when compared to the experiences of their black neighbors, friends, and family members. This relative privilege, they say, requires that they speak out in solidarity with Black Lives Matter in their own communities. It is a powerful example of cross-racial solidarity and action for justice. And it has inspired further actions of solidarity in the form of Latinx and African immigrant versions of the letter. The same year that Liang was convicted, Grace Y. Kao and Ilsup Ahn published their edited volume Asian American Christian Ethics: Voices, Methods, Issues. Kao, Associate Professor of Ethics at Claremont School of Theology, and Ahn, Carl I. Lindberg Professor of Philosophy at North Park University, were known prior to this volume for their scholarship in other subdisciplines within Christian Ethics. Kao was most well-known for her work on human rights and ecofeminism, and Ahn for his work on the ethics of immigration. This is not because of their lack of interest in Asian American Christian Ethics, but because in many ways the field had yet to be born. Indeed, one primary purpose of the text is to introduce Asian American Christian Ethics as a field of study. It is important to point out, however, that though Ahn and Kao did not have an extensive bibliography in Asian American Christian Ethics before the book was published they were the first two leaders of the relatively young Asian American Christian Ethics Working Group of the Society of Christian Ethics. The subdiscipline was birthed and nurtured into existence by the pioneering work of these two scholars and its existence is a lasting testimony to their efforts. Asian American Christian Ethics is an edited volume featuring twelve authors from multiple ethnic backgrounds and Christian traditions. Its diversity seems straightforward: Korean, Chinese, Taiwanese, Vietnamese, and Filipina authors can be found here. Baptist, Methodist, Presbyterian, and Catholic authors are present as well. This diversity belies the seemingly straightforward title and project of the book. The seemingly monolithic terms “Asian American” and “Christian” can veil the vast diversity of people, experiences, traditions, and commitments that they intend to describe. Historically speaking, “Asian American” is not merely a descriptive phrase. Rather, it is a category of identity intentionally created by Americans with ancestry in Asia during the 1960s with the goal of creating and mobilizing political power toward social justice. Inspired by the Black Power and Chicano movements of the time, people with ancestry from across Asia worked together as “Asian Americans” to build political power and pursue justice for the broader Asian American community across ethnic difference. Erika Lee traces this history clearly and succinctly in her recent book The Making of Asian America. The category of “Asian American” people does not exist free of this context. When one thinks of AACE, one should assume an orientation toward doing the work of Christian ethics in light of questions of social justice for Asians and those in relationship to them in America. Kao suggests a compelling four-part approach to defining the field and its methodolgy: AACE is Christian ethics about Asian Americans, by Asian Americans, for Asian Americans, and near Asian Americans. This proposed method for AACE highlights the individual and communal moral agency of both the ethicists who write and the communities about which they write. This description is necessarily broad so that it can include the wide variety of ways that Asians in America claim Asian American identity and utilize it to pursue social and political justice. Ahn proposes a method that he calls “cocritical appropriation,” which he elaborates in his chapter later in the book. In this method an Asian American Christian ethicist would draw on both historical Christian resources, primarily from Western Christianity, and traditional Asian and Asian American resources in a way that can be critical of, and constructive with, the other. In fact, Ahn argues, this is the way that all Christian Ethics is done. Western Christians drew from Plato and Aristotle and Roman law, to name a few sources, and put them in dialogue with biblical texts and Christian liturgies in doing their constructive Christian Ethics, and Asian Americans should learn from this model in doing their own work. In this way AACE can speak constructively to Asian American Christians and their communities in a way that enables faithful discipleship within the particular historical experiences of Asian Americans today. Ahn provides an example of how this might be done by putting famous virtue ethicists Aristotle, St. Thomas Aquinas, and Stanley Hauerwas in a critical conversation with the ancient Chinese idea of xin, which he translates as heart/mind.. An Asian American Christian virtue ethic, Ahn argues, will emphasize “keeping one’s heart” as well as rational deliberation. This is consistent with the holistic vision of virtue in Christian scripture, Ahn argues, and Asian Americans have cultural and philosophical resources that may uniquely enable them to have a more biblical vision of virtue than some Western versions of virtue ethics ,which ignore or dismiss the role of the “heart” as a center of the self. The essays in the volume represent these approaches well. Generally, the chapters proceed by providing some orientation to the primary ways Christians have thought about practical questions of ethics such as war and peace, family life, how to use wealth, how to respond to climate change, immigration, and healthcare. They then provide some context for how Asian Americans uniquely experience or relate to these topics. Chapters also often include brief reflections on Asian cultural values or philosophical traditions that influence contemporary Asian American experience. The chapters then conclude with some suggestions for the ways that Asian American Christians might draw on their Christian faith and experience as Asian Americans to respond to these issues in a constructive way. Keun-Joo Christine Pae, in her essay on the ethics of war and peace, represents this model well. She describes the unique ways that Asian Americans have been impacted by US wars in Asia (indeed, in many ways the most unique aspect of Asian American experience when compared to other people of color is how contingent their experiences of America are on whether and where the United States is fighting a war on the Asian continent), traces the primary Christian theories about the ethics of war (pacifism, Holy War, Just War, Realism), and proposes participation in the Eucharist as “everyday political activism infused with spiritual practice.” She says that “war and militarism are inevitably against the order of the Eucharist” because it is a transnational practice focused on reconciling enemies and provides training for Asian American Christians to live differently, by teaching them to invite strangers and enemies to the table of God, than the training soldiers receive when they learn to kill their enemies. Pae joins the editors in claiming that Asian Americanness as a self-identification is itself a moral achievement and suggests that the ability of Asian Americans to reconcile “between ‘Asian’ and ‘American’ in our identity,” when done well, “can on its own present some alternatives to war” because of the hybrid nature of such existence. “Freedom to be both Asian and American can on its own present some alternatives to war,” she writes, because it rejects exclusionary identities based upon racialized notions of who one’s enemies are. By embodying in one’s own self “Asian-ness,” “American-ness,” and “Christian-ness” one can subvert, contradict, and even defeat the logics of separation and difference that create war and have defined so much of the political history of the United States with the continent of Asia. In this way, self-consciously claiming an “Asian American” identity and being a Christian who participates in the Eucharist in an intentional way reinforces each other to resist war and violence. Not every essay follows this model: for example, Jonathan Tran’s essay explores the particular way that cosmetic surgery affects Asian American women. Many forms of cosmetic surgery, including surgeries to narrow and lengthen the nose and create eyelid folds, are often understood to make women of Asian descent appear to have whiter features. This is not a rare practice among Asian American women; indeed, I know women in my own family who have undergone at least one of these procedures. Tran’s essay does not proceed like the others, in part, because there is no long history of Christian theological reflection on cosmetic surgery. His work is very much “about” and “near” Asian American communities, however, and is perhaps the clearest demonstration in the volume of an ethical issue uniquely pertinent to Asian Americans. Tran points to Psalm 139, which famously sings that humans are “fearfully and wonderfully made” by God from time immemorial. Such declarations, Tran suggests, when confessed to one another in community can resist the cultural liturgies of cosmetic surgery by claiming the beauty of the ways we are created by God. Communal confession of such truths (another might be that we are created in the image of God) can resist dominant cultural narratives, scripts, and even liturgies (which he suggests cosmetic surgery might be) and tell a different story through our shared recognition of the authority of the Church. The creative possibilities of an explicitly AACE becomes clearer in these and other chapters. . 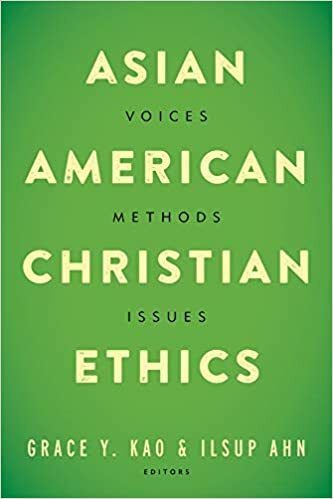 In this, the book is groundbreaking and required reading for anyone researching or teaching Christian Ethics in the American context. Given this overview, the most provocative essay in the volume warrants deeper attention. Ki Joo (KC) Choi’s essay on “Racial Identity and Solidarity” is a compelling critique of what he perceives as the predominant emphasis of Asian American theology and ethics: hybridity. A few years ago I wrote, with Christine Pae, an article in which we argued for the constructive possibilities of Asian American hybridity for cross-racial solidarity. Hybridity for Asian American Christians, we argued, is the nature of their racialized and religious existence in the US inasmuch as it (1) moves between mainstream and peripheral notions of what it means to be “Asian” and/or “Christian;” (2) is a critical stance toward “the politics of difference” that recognizes commonalities between marginalized groups; and (3) signifies the fluidity, interdependence, and tensions of the multiple group identities that Asian American Christians hold. In it we used case studies of Asian Americans utilizing their hybrid status both to resist racist representations of Asian cultures in Christian popular culture and to develop cross-racial relationships to resist environmental racism in post-Katrina New Orleans. Thus, I found Choi’s essay especially provocative, and it is especially poignant considering the political moment in which we find ourselves today. Let us remember the case of Peter Liang and the “Letters for Black Lives” movement. These examples are important because the thrust of Choi’s article is that an emphasis on Asian American hybridity in AACE is insufficient to ground or promote cross-racial solidarity. On its surface, this seems straightforwardly true. Clearly, hybridity as formulated by multiple Asian American theologians and ethicists, or any other theological idea for that matter, is insufficient on its own to motivate widespread, sustained moral action that entails risk or sacrifice. However, Choi obscures what hybridity actually means as a constructive ethical category and seems ambivalent at best about AACE as an intellectual and lived project akin to the earliest creation of “Asian American” identity as a political category. This lack of clarity appears at times in a few other essays in the volume. It appears that not everyone in the volume seems to conceive of AACE as a “moral accomplishment” rather than merely a demographic exercise. Choi’s argument is this: Asian American hybridity, defined as the experience of interracial and intercultural dialogue ,is insufficient to motivate cross-racial solidarity because Asian American reactions to such experiences are too often tainted by prejudice and participation in racist systems and assumptions. The descriptive part of this assertion is true. In making this assertion, however, Choi elides the important distinctions between race and ethnicity (indeed, explicitly conflates the two categories) and then uses ethnic conflicts between Korean and Japanese persons and their governments as an example of hybridity gone awry. Elsewhere he critiques a phenomenon he calls “Asian American whiteness” in which Asian Americans “embrace [the] attitudes, values, and practices mirroring white racism and privilege.” Asian Americans, as Choi points out, are as likely as not to embrace uncritically the values of capitalist consumption and forms of anti-blackness. The weakness of this argument is that it misunderstands hybridity as a normative idea and mistakes the failure of some people to embrace hybridity as a weakness in the idea of hybridity itself. As I understand it, and as Sang Hyun Lee defines it (the major theologian with whom Choi engages to explain hybridity), hybridity is not, at least primarily, a descriptive term. Rather, it is a conscious “acknowledgment and acceptance” of the liminal and hybrid existence of Asian Americans that can lead to “creative potentials” for socially just and morally formative action. Elsewhere, Christine Pae, Sharon Tan (who also contributes to this text), and I have made similar arguments which argue that consciously naming and living into one’s hybrid existence in the United States can be a moral act in itself. Indeed, again, Kao and Ahn begin the volume by claiming that something like this conscious decision is a “moral accomplishment.” Choi names this distinction between description and prescription but then speaks throughout the rest of his essay as if it is inconsequential. On the contrary, this distinction, the movement from description to self-identification and creative action, is where the moral value of hybridity lies. Secondly, in conflating race and ethnicity into the category of “ethno-racial” existence Choi is able, again, to elide the particular power of consciously accepting and conceiving oneself as living a hybrid existence that undermines the prevailing, often binary, racial order. Thus, in Choi’s essay all persons of Asian descent become Asian American in a purely descriptive way rather than in the self-consciously activist way in which it was originally conceived. So, again, the racism and prejudice of some Americans with ancestry in Asia, even of other Americans of Asian descent with different ethnic backgrounds, can become a critique of hybridity as a moral stance simply because some, or even many, Americans of Asian descent are racially or ethnically prejudiced or participate in some forms of racism. In this framing, the predominantly Chinese protesters of Liang’s conviction and the drafter of the “Letter for Black Lives” would equally relevant examples of hybridity even though the former was primarily ethnically based activism located in one ethnically Asian community and the latter was an active claiming of Asian American identity to work for cross-racial solidarity. Part of the reason that Choi frames hybridity in this way is because he frames AACE in comparison to Black Theology. He cites approvingly Cone and West’s use of blackness as a metaphorical and ontological category; a real category of being not determined by social constructions or conditions but as something approaching a metaphysical reality. In the case of Cone and West (as represented by Choi), this reality is the universal experience of oppression or the problem of evil as it is peculiarly manifested in the United States. No mention of scholars, such as Delores Williams, who criticizes this framing for being overly masculine or concerned with political liberation rather than every day survival is mentioned. Similarly, Victor Anderson’s groundbreaking Beyond Ontological Blackness, which was written in the mid-1990s, argues against the heroic masculinity of this particular way of reifying the black experience, but it receives no mention either. This is not to say that Choi does not provide an extensive enough review of the literature, but to say that his counter-example of how race might be understood theologically is actually more varied – perhaps more hybrid? – than he suggests. Asian American hybridity does not function in the same way as Cone’s use of “Blackness” as a metaphor for all oppression does, and it is not supposed to. Rather, it subverts the prevailing black-white binary that dominates American thinking about race. It subverts this binary in three ways: first, by explicitly naming the existence of persons not racialized as black or white; second, by subverting the assumptions of singular experiences of racialization and racism in American society; and, third, by providing analytical lenses drawn from Asian American experiences that create space to recognize shared experiences, interests, or build power across the divisions a black-white binary creates. In doing so, Asian American hybridity proves the binary to be a lie. It does this by highlighting that even though injustice against blacks and Asian Americans (among others) differs the shared experience of racism can motivate collective action across racial categories. I would suggest that the “Letters for Black Lives” campaign is an example of this in action. Young Asian Americans who contributed to the drafting, translation, and recording of the letter refuse to let their own experiences of discrimination justify their silence about injustice experienced by black Americans, and they reject the possibilities afforded by their relative “closeness” to whiteness or their “model minority” status to shield them from being in solidarity with #BlackLivesMatter activists. It is by consciously recognizing the ways that Asian Americans share in the experience of racism, but not in the particular ways that black persons do, that enables this form of solidarity. It is hybridity, as a normative ideal rather than a mere description of living in a diverse America, that motivates such action. This hybridity is not a description but is a moral action created out of particularly Asian American experiences. Where does AACE go from here? The shadow of a deep question is cast over the entire volume. What is Asian American Christian Ethics? I want to agree with Kao that AACE is by, for, near, and about Asian Americans as a demographic group. I also want to agree with Ahn that it should be “co-critical” in its use of Christian and Asian resources. However, I want to go further and suggest that AACE should be explicitly activist. AACE is a moral achievement inasmuch as it is a particular stance taken by Asian American Christians to work for justice for all. Asian American hybridity, defined as a conscious moral decision that grows out of the particularity of Asian American experience, can contribute much to this, but it is not the only resource available to do this work. Asian American Christians share a privileged identity with other Christians in the United States. The experience of racial oppression and relative privilege when compared to minoritized groups, is enabling solidarity across difference. And it is the hybridity of Asian American experience — as is so well-documented by many of the authors of the book, engaging everything from family life to health care to cosmetic surgery — that provides the unique resources upon which Asian Americans can contribute to moral reflection and action. For example, Asian Americans taking the Minidoka Pilgrimage are drawing on the experience of Japanese incarceration during World War II, and they are taking public stands of solidarity with Muslims in the US. This proximity to certain forms of power has the potential to enable solidarity not only across race, but across religious difference. The particularity of Asian American experiences provides fruitful ground for asking and answering some of the most pressing theological and ethical questions of our day. Jimmy McCarty, PhD, is Director of the Office of Multicultural Affairs and and Adjunct Professor of Ethics at Seattle University. He has published articles on Asian American Christian Ethics, transitional justice, racial reconciliation, and the theological ethics of Desmond Tutu.